When the news arrived that EgyptAir flight MS804 was missing, I was sitting in an ahwa, a small traditional local café, having morning coffee with two of my closest friends in Cairo: Aly Hamza, a law student, and Omar Hossam, a 23-year-old pilot. Such a scene is familiar to Egyptians. And so was the bad news. This was the third instance of aviation disaster for Egypt in the past year, after the October 2015 explosion that brought down the Russian Metrojet leaving the Sinai and the hijacking of an EgyptAir flight in March. In the café, we turned to the now familiar task of cataloguing this event: Terrorism? Conspiracy? Accident? Egyptians are known for being quite sociable, and the café soon turned into a forum of different people trying to analyze the situation. A 26-year-old waiter bellowed that the “Muslim Brotherhood” was probably behind this, a sentiment that would be loudly expressed by many anti-MB Egyptians in the days after. Another voice replied that the government probably planned this, and soon the two men were arguing. “Egyptian Flight MS804 Crashes and Burns.” This was no downturn to Cyprus, as was the fate of the hijacked flight. We started browsing Facebook pages, trying to figure out if anyone we know had been affected. I spent the rest of the day looking down at my news feed. On the alumni Facebook group for my school, the American University of Cairo, I learned that two alums were on board the flight: Ahmed Helal and Ghassan Abu Laban. My heart wrenched at two particular stories, one of them Laban’s. He was on board the doomed flight with both his parents and his wife Reem; the couple left behind two daughters. Since France is a popular cancer treatment destination for many Egyptians, there was a 30-year-old mother along with her husband on the doomed flight. They had sold most of their belongings, as mentioned by popular local Egyptian publication Youm7, to carry out an operation for the wife. In the end, they left behind three children. These were only a few of the human stories that were bellowing on Egyptian social media, and many more have since been unveiled. Consequently, apart from attending the public memorial services for the victims, there were many efforts by the locals to try and help their families, which included starting a fund for the children whose parents were deceased on the doomed flight. …after the first few days, the concerns about safety turned to worries about the effect the crash would have on Egypt’s already struggling economy and tourism industry. The next day, I was on the phone with one of my close friends from university, whose voice sounded hoarse. She told me the story of her childhood friend who was one of the flight attendants on board. A little while later, I received an unrelated group message exclaiming, “Don’t call her! Or do anything yet.” Scrolling up, I saw that a family member of an old friend was the co-pilot aboard the flight. At the university, the conversation was both about causes and reactions. Western news agencies kept invoking “terrorism” even though no one yet knew what had brought the plane down. This soon became a topic. So did fears about other flights. More recently, I was back in the café and people were still worried about reasons for the tragedy. But around Cairo, you see more signs of people mourning those who perished on the flight. 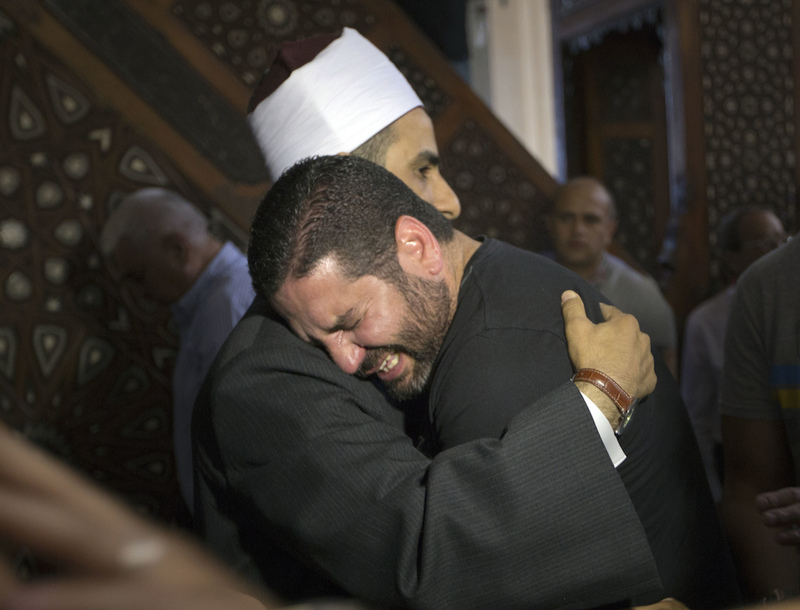 Given that mourning in Egypt is a public affair, Muslims and Christians alike were carrying out memorial services for the victims all over Egypt. People are saying the “Salat Gha’eb” or “prayer of the absentee.” According to my Islamic faith, these people died as martyrs, since they were considered to have been killed protecting themselves and their families. They get the highest reward in the afterlife and all their sins are erased. Today, efforts to remember those who died aboard the flight continue. Several families have started charities to commemorate their lost loved ones. What has brought comfort for some is an Egyptian expression that says, “The way you die reflects a lot about the way you lived.” The martyrs of Flight MS804 died on a Thursday. The very next day was Friday, when they were prayed for in the mosques—the close timing suggests just how very dearly God loved them and how they will never be forgotten. Seif Diab is a construction engineering student at the American University in Cairo. Primary Editor: Joe Mathews. Secondary Editor: Siobhan Phillips. *Photo courtesy of Amr Nabil/AP Photo.